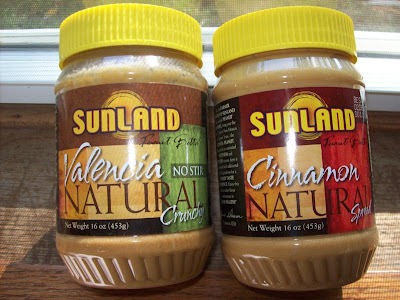 Sunland sent me two of their delicious peanut butters for review. I chose the Valencia Natural Crunchy PB and the Cinnamon Natural PB. They both were very delicious!! They have about the same nutritional information as other nut butters. They also sell caramel PB, almond butter, banana PB, etc! The peanut butter is very reasonable starting at only $4 per container! I was very impressed with this delicious peanut butter and cannot wait to try more flavors. The giveaway will be for one six pack mixed case of peanut butter/almond butter from Sunland!! The giveaway is open until Midnight on Saturday September 18th. Winner will be chosen on Sunday September 19th using Random.org. Visit the Sunland website and let me know what flavor of peanut butter that you want to try the most! Already a subscriber & have always wanted to try the cinnamon flavor but never have. I'd like to try the caramel peanut butter spread. I found your site through a blog hop! I would love to try the dark chocolate peanut butter! You're on my blogroll on the right side of my page. I want to try the Dark Chocolate flavor! You found me on a blog hop, and I've been following you since then! I don't think this one is for Canadians but it sounds to yummy not to try - the Cherry Vanillia Peanut butter - oh yum! Since I started loosing weight (I have lost 100 pounds) I have PB on my one peice of whole wheat toast every morning and to have something like that - oh bliss. I would love that. I found your site a while ago, but I am not sure how! I've been following you ever since! Entered GU Performance Energy g/a! I would LOVE to try the Cinnamon Peanut Butter! oh man - hard to decide between dark chocolate & carmel??? Dark chocolate peanut butter?! Yum! I'm going to have to go with the Organic Dark Chocolate Peanut Butter. I follow now. Please drop by my blog and say hello. I can't wait to read more posts here. I'm a chef who is married to an organic farmer! I found you on la bella vita. The question is, how did I find her? lol I think I went on a gigantic blog loop today! I entered the Lia Sophia giveaway too. Your ring is gorgeous! I found this site through another blog. I entered (previous to this one) the water bottle giveaway! I'd love to try the Natural Valencia Creamy Peanut Butter, No Stir and also the Banana Peanut Butter Spread. Thanks for the review and giveaway! I would love to try the Banana Peanut Butter Spread. Caramel peanut butter sounds awesome! Natural Valencia Creamy Peanut Butter, No Stir - 16 oz. I think my kids would love this! I'd love to try Dark Chocolate Organic Peanut Butter. I found you through Ten Talents low entry linky. i would love to try the banana peanut butter. it sounds so yummy! Love the banana and raspberry flavor.Am a follower of your blog.Going green by buying organic.